Armstrong Steel has recently announced its plans for a new, larger facility in the Denver Tech Center and intends to substantially increase its recruiting efforts to hire experienced pre-engineered metal building experts. This enhanced recruiting activity is designed to increase staffing levels in anticipation of the ever-increasing demand for Armstrong Steel Buildings. Armstrong Steel is particularly seeking individuals with pre-engineered metal building expertise and an established track record of success. DENVER –Armstrong Steel has recently announced its plans for a new, larger facility in the Denver Tech Center and intends to substantially increase its recruiting efforts to hire experienced pre-engineered metal building experts. This enhanced recruiting activity is designed to increase staffing levels in anticipation of the ever-increasing demand for Armstrong Steel Buildings. Armstrong Steel is particularly seeking executives with pre-engineered metal building expertise and an established track record of success. Armstrong Steel on Friday announced it has begun hiring and recruiting additional pre-engineered metal building executives out of Pittsburgh, Houston, and across the country to support the widespread demand for Armstrong Buildings. Armstrong Steel made the announcement Friday at it’s Colorado Corporate Offices in Greenwood Village and outlined its plan to attract new employees, underscoring its commitment to expand its global presence. As trends continue to demonstrate an increasing demand for Armstrong Steel Buildings, maintaining a high quality workforce with strong pre-engineered metal building knowledge will ensure that Armstrong continues to deliver the level of expertise & service Americans have grown accustomed to. “These are busy days indeed for Armstrong Steel and we are seeking new team members with a wide variety of skills, experience and enthusiasm to grow with us as we head into 2012,” says David Nardozzi. Armstrong Steel is the nation’s leading pre-engineered metal building OEM manufacturer. With highly competitive wages and comprehensive benefits, Armstrong jobs are among the best in the industry. A large part of Armstrong’s success can be attributed to its outstanding project management & support staff. Customers receive wet-stamped blueprints faster, get their building materials delivered quicker, and are able to get the answers they need on-site more effectively than the competition. “At Armstrong Steel, our strength is our people. One of our goals is to build on this strength. Our recently announced plan to recruit more executives represents a major commitment to broaden our reach across America. 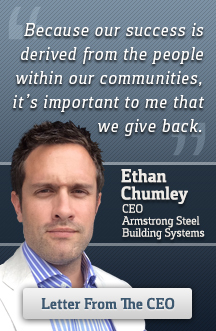 Recruiting and retaining the best talent in the industry is critical to Armstrong’s long-term vision,” says Ethan Chumley, President of Armstrong Steel. A career with Armstrong Steel allows you to participate in the administration, design, detailing, marketing, selling, manufacturing and installation of its products. Armstrong Steel is actively recruiting executives proficient in MBS who possess pre-engineered metal building expertise and an established track record of success. Armstrong Steel recognizes that its people are its strength, which is why they offer a competitive base salary, significant commission potential, comprehensive benefits, bonuses, and complete relocation packages for its employees. Armstrong Steel has grown from a small steel buildings supply company to the #1 pre-engineered metal building OEM manufacturer in the nation. Armstrong’s insistence on low prices and excellent quality catapulted them into national prominence - it was those low prices that allowed them to expand into new markets in the years that followed. If you would like more information about Armstrong Steel, please call them at 1-800-345-4610 or visit http://www.armstrongsteelbuildings.com.